There may be many security softwares to protect your PC from internet and computer threats, but as the famous proverb says “Prevention is better than Cure”, you must know the weak and strong points of your computer system. Hiring a professional would be expensive for home PCs. This is where Belarc Advisor comes into action. BELARC ADVISOR is the most powerful and free personal PC audit program to analyze your computer weak and strong points and prepares a detailed report which includes installed software and hardware, antivirus status, and many more. It displays the report through your default web browser. This information is kept safe and private and not sent to any server. As said earlier, Belarc Advisor doesn’t fix the problems, but only offers you the complete analysis of your PC and advices to improve and repair. This is very useful for home PC users, who want their systems to be secure and update. 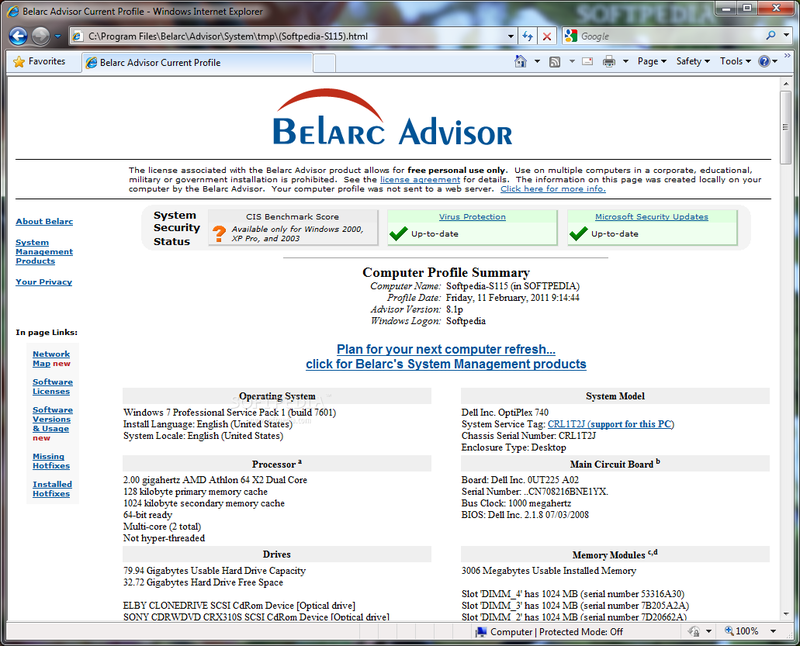 Coming to Belarc Advisor installation process, any of the previous versions will be removed automatically. Before installing this product make sure that your firewall software does allow applications to connect to the internet. Then only the installation will work. Displays complete report of every software and hardware installed, security standard references, missing Microsoft hotfixes, network inventory and antivirus status. Uses Center for Internet Security (CIS) test to reveal overall security level and displays report on default web browser. Shows the kind of RAM you are using and which RAM slots are engaged. Completely free and single PC use only for non-commercial purpose. Retrieves keys or serial numbers of softwares installed. Supports Windows 7, XP, Vista, 2008, 2003, 2000, NT, 98 and 95 OS (32-bit and 64-bit). Supports IE, Firefox, Safari, Opera and many other web browsers. 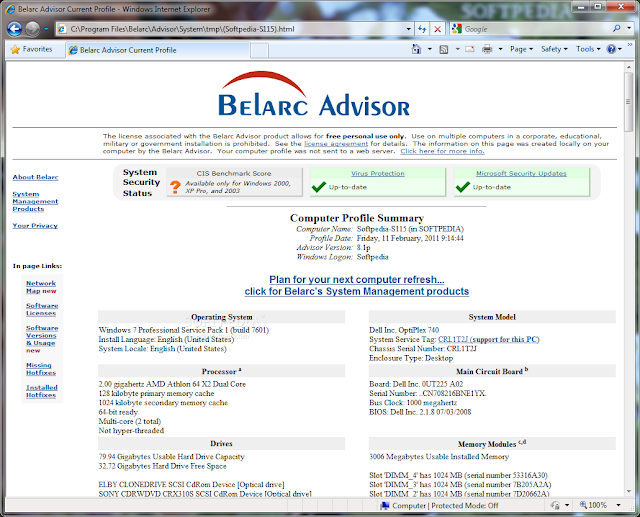 Download the latest version Belarc Advisor 8.2g from its official website.